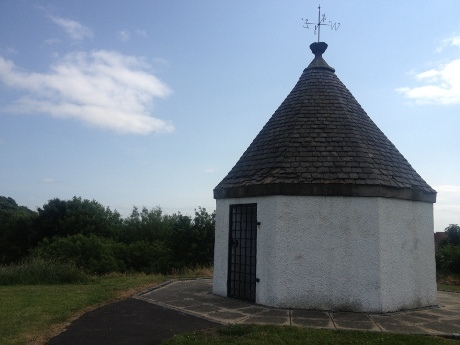 Starting on the New Town Trail this route takes you along the banks of the River Irvine through the town centre and finishes at the Robert Burns Statue on the Irvine Moor. This route allows you to take in some of the great scenery found along the River Irvine and you are never too far form the local wildlife that live along the river banks. The route does cross a couple of busy road and although pedestrian crossings are available additional care should be taken in these areas. 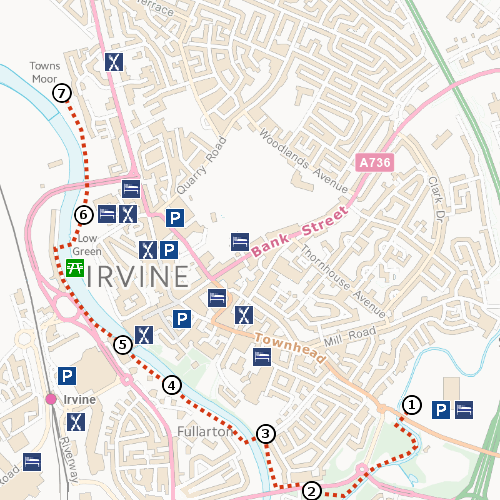 The closest facilities when following this route are within the town centre which can be easily accessed from the area surrounding the Rivergate Shopping Centre. The path on this route is very well maintained so is suitable for people of all ages and abilities. The route is suitable for wheelchair users and those who require walking aids. There are some sections of this route there the path is reasonably steep, though should not cause any major problems for people following the route. 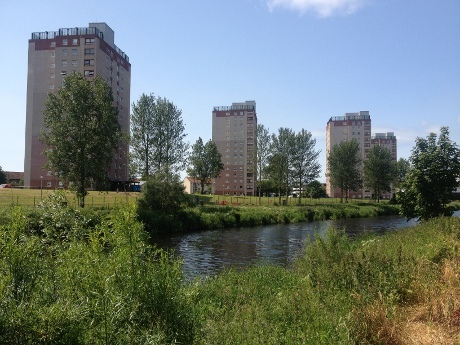 This walk starts on the New Town trail, between Sillars Meadow and the Menzies Hotel. Follow the path to the pedestrian crossing at the main road. After crossing the road proceed across the bridge that crosses the river. Immediately after the bridge take a left turn on the path that following the river. Continue along the path which is running along the banks of the river, taking the right turn when you reach the foot bridge. Now follow the path until you reach the main road. Cross the road using the pedestrian crossing and stay on the path that us following the river. When you reach the foot bridge you can continue along the the same side of the river. However we would recommend crossing the foot bridge to the other side before proceeding to follow the river as the views from the other side across the the Golffields and Old Parish Church are much better. After crossing the river using the foot bridge you will be able to look back across the river at the Golffields and the powder house which sits within the fields. The Golffields is a large area of grass that was once used by herdsman who allowed their cattle to graze here while they spent time playing golf. This pastime proved so popular that there was an attempt to ban this to stop locals from neglecting their duties. As you follow the river along the the banks the Old Parish church will come into view and sits proudly on top of the hill on the opposite side of the river. 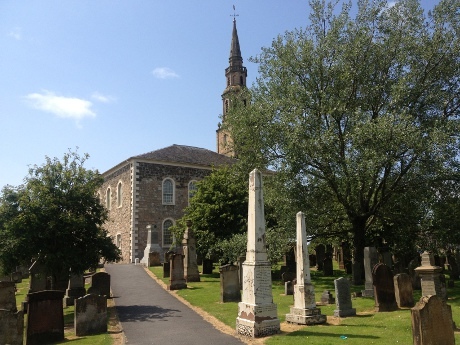 The church’s website contains a list of “notable graves” as well as more information on the architecture and the history of the church building. Continuing along the path The Rivergate Shopping Centre will come into view. This is the largest shopping centre in North Ayrshire and spans the river. The centre sits on the site of the old stone bridge which was demolished in 1984 to make way for the construction of the shopping centre. The path will take you under the shopping centre and beside the Fullarton Church. 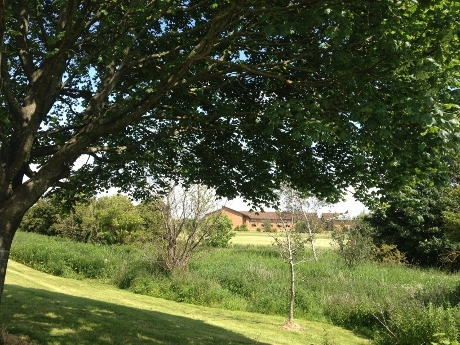 Across the river you will see the picturesque Low Green. Passing under the Rivergate Shopping Centre continue along the path the street called Waterside that overlooks the Low Green. The Waterside was prone to flooding until extensive work was carried out to install flood defences to protect the houses. Continue along the Waterside until you reach the green foot bridge that crosses the river into the Low Green. Proceed across this bridge. This is a popular leisure and recreational area and is commonly used by families to have picnics and to enjoy a sunny day. Leaving the Low Green continue along the path on this side of the river passing under the main road. This path leads into the Irvine Moor where you will find the Robert Burns statue. This statue marks the end of this walk. 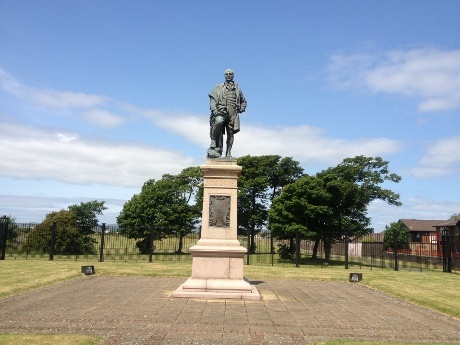 From the Robert Burns statue you can follow the path into the housing estate to the main road which will allow you to catch the number 11 bus back to the Menzies Hotel or alternatively you can walk the route in reverse to return to the beginning of the walk.